On the recommendation of a good friend, I bought the Canon HV20 last fall and have been thrilled with its performance. Now I find out that it's on sale so I'm passing this info along. A $699 camcorder may not seem like a bargain, but hear me out. 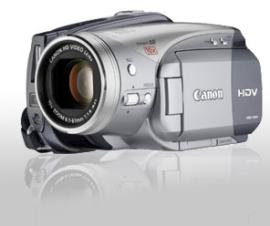 The Canon HV20 captures stunning high-def video (so says CNET) and includes high-end features like HDMI output (so you can connect it directly to your HDTV), instant auto-focus, and a "hot" accessory shoe. Normally it sells for around $799, but Dell has it on sale for $699.99 shipped. If you're still shooting in standard-def, do yourself a favor and upgrade to an HD camcorder like this one. The difference is just jaw-dropping. The HV20 stumbles a bit in low-light environments, but that's true of most consumer camcorders. I like that it relies on standard MiniDV tapes, which I find preferable to memory cards or hard drives: They're cheap, easy to store, and compatible with most video-editing programs. Dell customers rated the HV20 4.7 out of 5, while CNET readers gave it 8.3 out of 10--pretty admirable scores. I'm not sure how long this deal will last, so if you're looking to save big on an HD camcorder, don't wait. Intermittent reports this weekend of problems (again) with the Blackberry network. Some users are reporting no problems at all while others are reporting outages. FYI for you Blackberry users. ePocrates offers 2 for 1 sale! I received the following discount offer from ePocrates (drug database and interaction guide) and wanted to make sure I passed it along to you. Here is the e-mail with the generous offer I received. The company has given me permission to extend this discount to my readers, so needless to say I wanted to make sure everyone was aware of it. In honor of St. Patrick's Day we had a special Epocrates 2-for-1 discount offer but figured we'd extend it to the end of the month to give more folks a chance to get in on the deal. Below is the info for the discount, they can buy Two Years of Epocrates Essentials for the price of one. Visit http://www.epocrates.com/products/ and enter code: STPATESSEN during checkout to get the Epocrates Discount! If you have more than one USB device that you need to charge on the go, take a look at this. 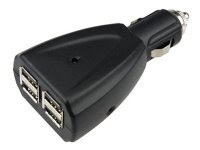 You can charge 4 USB devices all from your cigarette lighter/charger port in your car or some airlines. This is a handy device that is pretty compact. It costs $12 and even has a DC port with a variety of adapters so that you can also charge your phone with it. DDS Ventures, Inc., a San Diego-based dental services company, today announced the release of its innovative patient referral and laboratory case management system, ddsWebLink for dental care providers. This Web-based system enables dentists, dental specialists and dental laboratory professionals to more efficiently track, monitor and manage all inbound and outbound patient referrals and laboratory cases, along with their associated images, documents and case files, automating what has traditionally been a paper-based process. As a Web-based solution hosted in a secure, HIPAA compliant environment ddsWebLink customers are able to benefit immediately in that they can be live on the system in just a few short minutes. With collaborative information stored centrally, dentists and their referral partners can securely access this information from any computer with Internet access making it easier to communicate with one another at more convenient times, in a more convenient way. ddsWebLink is currently available for use by dental professionals in all 50 states and will soon be accessible to our neighbors in Canada and Mexico. For more information email info@ddsWebLink.com or go to http://www.ddsWebLink.com. DDS Ventures, Inc. is a privately-held company headquartered in San Diego, California. The company is committed to helping dental professionals leverage the value of today’s innovative technologies via its progressive online service offerings and world-class educational programs. I've mentioned the F5 Tablet from Motion Computing before, but I've found a very comprehensive review of the device that I think bears reading. If you are interested in Tablet PC's and especially the F5, you owe it to yourself to take a look at the PC Mag review. 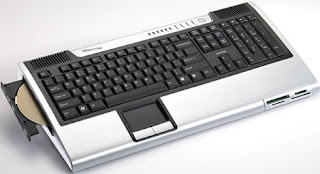 If you are really tight for space and have no room for the beige box that houses a computer, try this computer in a keyboard form factor. The picture above shows it all. The computer is actually housed in this oversized keyboard. All you need is a monitor to connect and you are ready to go. These devices cost between $629 - $1099 depending on what you need as far as RAM etc. As regular readers know, I love multiple monitor setups. Whether it's in the clinical area for an "over the patient" monitor or on my desk, I'm more productive with more than one screen to work from. LG has come up with a cool solution for those who want 2 or more monitors. Their Flatron LX206WU is a 20.1 inch flat screen. It boasts a 5,000:1 contrast ratio and can swivel 90 degrees on the included stand. The best part, however, is that you can link multiple monitors together via USB. Since linking is so easy, there is no reason to stop at just 2 monitors. Although this might be a bit harder to setup in a clinical situation, this should make a desktop setup a breeze to get up and running. It's Official! Although details are not yet available, major news outlets are announcing that the Justice Department has given its blessing to the XM - Sirius merger. Satellite subscribers should now rejoice. I, for one, am anxiously waiting to see what lies in store for my channel lineup. There is a big emphasis on going green these days and why not? Being wasteful simply doesn't make sense. Here is an interesting item that could actually help you go green and make your life easier in the process. It's the FreeLoader. The device uses a solar cell to charge its battery that can then be used to power other devices or charge them. Although from what I've read the system takes quite a while (several hours in the sun) to charge itself completely, it's still using free solar energy to do so. 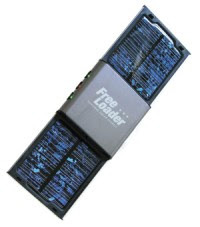 Once charged, Freeloaders internal battery can power an iPod for 18hours, a mobile phone for 44 hours, PSP for 2.5 hours a PDA for 22 hours and much much more (according to a site that sells the device). It's available online for about $60. Definitely an interesting idea. 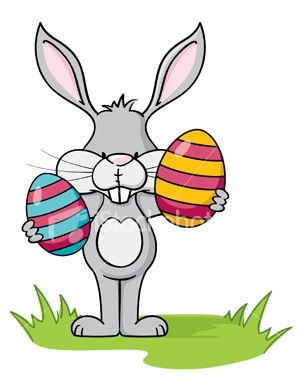 From the Flucke's to all of you, we'd like to offer our wishes for a Happy and Blessed Easter. Hug your loved ones and let everyone know how much you love them. Back to tech blogging on Monday! OK, I'll admit it. One of my pet peeves is the constant influx of self updating software that also wants to install other junk too. Did it ever occur to anyone that if I want to install other useless programs that I am perfectly capable of doing it myself? I'm an Apple fan, but in the last week I've been getting iTunes updates on all of my Windows machines that want to install Apple's Safari browser. Really, what does a web browser have to do with iTunes? The answer, in short, is *nothing*. This is just an attempt to get you to download more software that you don't need. I love Firefox and use it on my Windows machines as well as my MacBook Pro. Do I really need 3 browsers so that I can have 2 of them taking up hard drive space and doing nothing? Heck, I don't even use Safari on the Mac platform. Nice try Apple, but save the sneaky tactics. I expect more of you. Of course, maybe now I don't. Running Vista? Want to know what a few of the experts think of Redmond's latest update? Take a look below. PC World: "Pre-SP1, the [1.9GB] file copy averaged 384 seconds; post-SP1, the copy process showed a noticeable improvement, averaging just 348 seconds to complete the same task. That's a 9 percent improvement, a difference you're likely to notice... It's not life-altering when you're talking about just 2GB of data, but if the performance improvement holds across larger data sets, that will be a big boon to anyone copying data in the Vista environment." PC Mag: "From the beginning, Vista had some significant issues with excessive hard drive use. The drive light would routinely stay fully or mostly lit for many minutes at a time, even when most programs had been closed. The downloaded SP1 improved this quite a bit, resulting in crisper performance... even with Office 2007 Professional, Adobe Creative Suite CS3, and Norton System Works 2008 on the machine and various components of each running (Outlook, Word, InDesign, Acrobat, and Norton AV, for instance), the drive light stayed remarkably unlit on the SP1 clean install. This issue bears watching: If the difference turns out to be as significant as it seems, then it alone is reason to upgrade." Anandtech: "Compared to where we were a year ago, our general recommendation for Vista is unchanged. We are however impressed with the progress of the x64 versions of Vista over the past year, after feeling like it was lagging behind Vista x86 from beta up through the release version of Vista. Vista x64 is now clearly on par with Vista x86 and we have no concerns about its compatibility or performance." CNet: "Do you need Windows Vista SP1? Yes and no. It's always good to install the latest (read: patched) code for any operating system. But downloading and installing the update will take some users a few hours without any visible or tangible improvements to their systems." Thanks to Gizmodo for compiling the comments. I've mentioned them here before, but we're about to see a major shift in hard drive design with the market shifting to SSDs (Solid State Drives) with no moving parts. The biggest stumbling block up to this point has been drive size. When you can buy a laptop today with a 120GB hard drive why would you settle for one with a 32GB drive? Yesterday Intel announced that in second quarter 08 they will be selling a 160GB SSD. This brings a whole new feel to the playing field. Add to that the fact that they are supposed to be faster than any other SSDs and faster than conventional drives and the writing is on the wall. In the not too distant future spinning platters will be a thing of the past. It can't happen fast enough for me. The folks at Saitek make nifty devices that are small and easy to use. 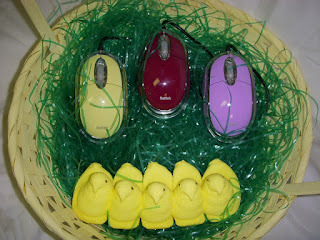 For Easter they have several of their Notebook Optical Mice available in Easter colors. I happen to have one of these mice in a bright orange color and have been really pleased with the construction and performance. They are small (great for those little hands that get Easter Baskets) and durable. You can order a mouse from the Saitek website for $19.95. Windows Vista SP1 Available today? The rumors are flying and supposedly today is the day for Vista Service Pack 1. This update, which the rumors say will be available for manual download only, should fix a plethora of problems that have plagued the Operating System for a very long time. I'm not sure if the rumors are true, but if you are using Vista, it's definitely worth checking out. As for me? I'll use Vista as soon as I can't get my hands on a copy of XP Pro, thank you very much. Could StreamSmart change the way we listen? I've heard rumors of a technology called "StreamSmart". In a nutshell the technology would allow you to listen to satellite radio and Internet radio on any device you own that has Internet access. This is an interesting concept (not yet proven though) that could well change the way our entertainment data follows us. StreamSmart will be the multi-platform replacement for SiriusWM5 as well as the iSat and SiriusGTX projects. The brains of the solution will reside on a server allowing a more feature rich solution while retaining a small client footprint. Beta Release 1 - Addition of Various Internet Radio Stations based on locality for Windows Mobile. Also, the ability for the user to add their own streams as channels for selection. Beta Release 2 - Addition of a Web Based Client. This client will be usable by any client with a web browser and a player capable of decoding Windows Media streams. This means Windows Mobile, MAC OSX (with WM plugin for Safari) and any cellular phone that can run a CorePlayer or TCPMP version that supports Windows Media streams. Final Release - Same as Beta 2 but with less bugs. Zero bugs is what we want, but lets be realistic and say less bugs and any existing bugs should be minor. At this point there will be maintenance releases as needed, but most changes should be server side. Next Major Release - This is where we add the transcoding... this will allow platforms not capable of decoding Windows Media streams to stream Sirius/XM. Some internet radio streams will stream QT or other formats, so BB and iPhone users *may* be able to stream some of the other stream sources from internet radio stations (or other user added sources) prior to this release. This application will be free... with one caveat. If you are on a platform that requires the stream be transcoded, we will have to charge in some fashion or generate Ad revenue. This is because we will have to grab the stream, convert it, and stream it from our server. Thats going to use a LOT of bandwidth. Currently I foot the bill for GeeksToolBox (with the the help of those who have donated.) The cost of streamsmart.net will be too much to shoulder on my own. My goal for the transcoded solution is to create a component that can be installed anywhere to do the conversion. So... you will have the option to install it on your home PC and leave it running and do the transcoding yourself. It will also allow us to solicit possible sponsors to do the transcoding in exchange for Ad placement in the client view. So... you may have to pay in some form if you need a transcoded stream. Maybe a monthly fee, maybe a by usage fee, and you may possibly see ads. If you are someone (like me) that needs access to your files on the go, but don't want the hassle of carrying your laptop with you at all times, take a look at the StealthSurfer from Hushmail. This nifty little device performs a very neat trick. 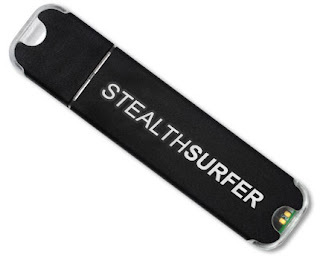 When you plug this USB jump drive into a Windows PC, it tricks the computer into thinking the StealthSurfer is the hard drive. This means you can open files, surf the web, check e-mail, basically do anything you would do on your regular PC. That's because the StealthSurfer makes the host PC think it is your PC. The device is protected with a password that makes it impossible to use without the password (ask me how I know). The best part is when you unplug the StealthSurfer all traces of your activity disappear with it. Since the device functions *as* a PC, all of your browsing history, passwords, etc leave with it and leave no trace behind. This is a big thing for me. As I travel, I'm frequently using computers in hotel business centers to access online check-in for airlines. Now I can do all of that and not worry that my passwords or browsing history are left behind. MojoPac Deluxe - Portable computing environment - take your programs and files with you to another computer. Tor - Complete Network Security - Hide your IP address from hackers with IP masking for an anonymous proxy server. Hushmail Premium - Web Based Email Solution - High Internet security encryption to keep your emails private and secure. No cost for up to 4 years of Hushmail Premium. RoboForm PRO - User ID/Password Management Application - One-click form fill never lose your private internet passwords again. Firefox - High-speed Secure Web Browser - The popular free web browser with enhanced security features that makes private surfing easy. Thunderbird - Portable E-mail Access - Secure email access from any computer with this USB software package. I've been using StealthSurfer for a few weeks now and have been very happy with it. This product is *highly* recommended. These photos are courtesy of my good buddy Paul Feuerstein who was in Atlanta presenting at the Thomas P. Hinman meeting. I'm relieved to report that Paul and everyone I've been in contact with is OK, but a tad dazed from the tornado. My prayers are with everyone impacted by this tragedy. To my friends, get home safely and hug your families. I'll return to tech blogging tomorrow. Due to damage to the GWCC, the Himan meeting has been cancelled. I don't have reports of injuries, but speakers and vendors say damage is substantial. Reports I'm getting are of windows blown in, luggage sucked out of rooms, and one laptop destroyed when the window was blown into the room and crushed it while it was being used. The owner of the laptop escaped with only minor injures. The GWCC (exhibition hall) has many windows blown out and with more storms on the way, people are not being let back in. I'm also getting reports of lots of windows blown in on cars. Reports from CNN say 27 injuries in Atalanta, but no deaths. Thank God for that. Due to extensive damage sustained by both the Georgia World Congress Center and the Omni Hotel at CNN Center – the site of the Thomas P. Hinman Dental Meeting -- we will not be able to continue the meeting on Saturday, March 15. The safety of the attendees and exhibitors of the Thomas P. Hinman Dental Meeting is our primary concern at this time. According to Dan Graveline, Executive Director of the Georgia World Congress Center, for the purposes of safety, people cannot be allowed to return to the facility. In addition, Gary Froeba, Regional Vice President and Managing Director of the Omni Hotel at CNN Center, has advised us that the Omni Hotel at CNN Center is currently occupying guest rooms that have no damage to the windows. Guests with window damage are being relocated to hotels throughout the city. The Omni Hotel is no longer taking reservations or conducting meetings until further notice. The organizers of the Thomas P. Hinman Dental Meeting will actively communicate with both attendees and exhibitors in the days ahead. We appreciate everyone’s patience and understanding during this time. As you all know, a powerful storm caused significant damage to the Georgia World Congress Center in several major areas of the facility. The State Fire Marshall and his team of assessors will be inspecting the building throughout the weekend and will update Hinman and Shepard Exposition Services on Monday afternoon as to the ability of the crews to move safely throughout the building. Unfortunately, until that time, Shepard will have no more access to the facility than the exhibitors. If your travel and other work responsibilities do not allow you to remain in Atlanta during this process, please contact Shepard at 404.720.8600 . Shepard will do everything possible to assist with the pack-up of your exhibit and other materials and to help you determine any damage incurred to any property. If you have used an Exhibitor Appointed Contractor (EAC), please notify them of your dismantle requirements. Shepard will work with these contractors to get your materials shipped out with minimal delays. During this process, we appreciate your patience and understanding. Here is some good information for those of us who recommend denture cleansers to our patients. This is to alert you to the risk of allergic reactions in users of denture cleansers, and the risks of misusing these products. The FDA has received at least 73 reports of adverse events, including at least one death, related to the use of denture cleansers. These adverse events have occurred both when the product has been used properly as well as from improper use. The allergic reactions can occur soon after the patient begins using the product, or after years of use. The literature and research suggest that the ingredient in denture cleansers responsible for these reactions is persulfate, a known allergen. Persulfates are used in most denture cleansers to help clean and bleach the dentures. In addition to reports of allergic reactions, FDA has also received reports of severe adverse events, including at least one death, resulting from misuse of the product. Some patients have gargled or swallowed it, resulting in abdominal pain, vomiting, seizures, hypotension and difficulty breathing. Be aware that patients who wear dentures may present with symptoms of an allergic reaction, and that the denture cleanser may be the cause of the reaction. Educate your patients and their caregivers about the symptoms of an allergic reaction to persulfates in the denture cleanser. These symptoms can include irritation, tissue damage, gum tenderness, rash, urticaria, respiratory conditions and hypotension. Educate your patients and their caregivers about the proper use of denture cleansers. Even though the product labeling may mention mouthwash as an ingredient, the product should NEVER be ingested. Ingestion can result in esophageal ulcers, abdominal pain, vomiting, burns, irritation, breathing problems, hypotension, seizures, gum tenderness, bleaching of tissue, and blood in the urine. Additionally, an accompanying Advice for Patients document can be found on the FDA website at http://www.fda.gov/cdrh/medicaldevicesafety/atp/022508-denturecleansers.html. FDA is recommending that all manufacturers of denture cleansers modify their labeling to include warning information that the product contains persulfates, which are a known allergen, and to improve the directions for use on their labeling in order to reduce misuse. We are also recommending manufacturers consider appropriate alternatives to use of persulfates. We believe these actions will minimize the risk of adverse reactions. We encourage you to report adverse events related to denture cleansers, whether caused by an allergic reaction or misuse. You can report cases directly to the device manufacturer or to MedWatch, FDA’s voluntary reporting program. This can be done on line at www.fda.gov/MedWatch/report.htm, by phone at 1-800-FDA-1088, by fax at 1-800-FDA-0178, or by returning the postage-paid FDA form 3500 which may be downloaded from www.fda.gov/MedWatch/getforms.htm. You can also report by mail to MedWatch, 5600 Fishers Lane, Rockville, MD 20852-9787. If you have questions about this notification, please contact Nancy Pressly, Office of Surveillance and Biometrics (HFZ-510), 1350 Piccard Drive, Rockville, Maryland, 20850, Fax at 240-276-3356, or by e-mail at phann@cdrh.fda.gov. You may also leave a voice mail message at 240-276-3357 and we will return your call as soon as possible. FDA medical device Public Health Notifications are available on the Internet at http://www.fda.gov/cdrh/safety.html. You can also be notified through email on the day the safety notification is released by subscribing to our list server. To subscribe, visit: http://service.govdelivery.com/service/subscribe.html?code=USFDA_39. Malvern, PA (March 13, 2008) – DentalEZ® Group, a supplier of innovative products and services for dental health professionals worldwide, is pleased to introduce the latest in its growing line of StarDental® products, the new ergonomically-designed BlisSonic™ Sonic Scalers. The BlisSonic SW (swivel) and BlisSonic K (fixed connection) are portable, air powered sonic scalers available in 4-line swivel and fixed backend configurations. The 360 degree Quick-Connect Swivel (available only on the SW Sonic Scaler) reduces tubing drag for optimum operator comfort, and enables quick disconnection of the scaler for sterilization. The new lighter design of the BlisSonic ergonomic Sonic Scalers is clinically proven to effectively remove stubborn hard calculus deposits and stains from the tooth surface, while providing an extremely gentle cleaning process for patients. The slim anatomical blueprint of the BlisSonic allows for easier movement in the oral cavity, permitting a thorough scaling even in tight, hard-to-reach interproximal areas. Sub-gingival and supra-gingival scaling is easily achieved. The newly-designed removable, ergonomic silicone grips of the BlisSonic are autoclavable up to 275 degrees F (135 degrees C). Replacement grips are available in pastel shades: blue, aqua, purple, and pink. Because of the assortment of grips available, the BlisSonic provides a great time-savings aspect since it can continue to be in operation while autoclaving the grip. Moreover, hygienists can also color code their BlisSonic with other hand instruments. The scalers come equipped with five exclusive StarDental-patented scaling tips designed to employ a controlled, even water spray, providing a fog-free view and eliminating the unsavory patient “drowning effect” often experienced with other water spray systems. The tips are steam-sterilizable up to 275 degrees F (135 degrees C). A Sensi-Tip® kit is also available for the BlisSonic Sonic Scalers, which includes 50 disposable tips. Sensi-Tips are designed to work gently and effectively on cosmetically enhanced patients with implants and veneers, as well as patients experiencing gingival recession due to periodontal disease. In addition, the BlisSonic Sonic Scalers are safe to use on patients with heart pacemakers. Completely portable, the BlisSonic conveniently connects to existing air driven handpiece tubings, with no need for extra control boxes or foot controls. For more information on the new StarDental BlisSonic Sonic Scalers, call 1-866-DTE-INFO or log on to www.dentalez.com. 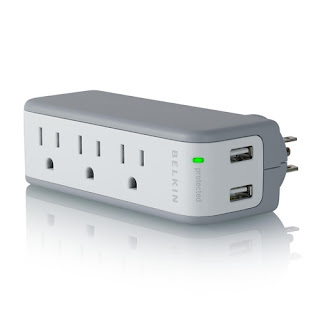 If you travel, or just have need for USB charging and don't want to use the computer, here's a nifty idea from the bright people at Belkin. This power strip plugs into a standard outllet and creates 3 outlets. However, the best part is located on top where there are 2 USB charging outlets as well. This means you can charge your iPod/MP3 player, wireless headphones, or other USB gear without using an adapter or a computer. It's available for $25 and is one of those better mousetrap kind of gadgets that Belkin is known for. 18 months ago, when I switched my primary laptop from Windows to my MacBook Pro, one of the things I began to really love was Google Calendar. I'd had the Google Calendar account for some time, but really hadn't used it much since I like to have all of my info with me wherever I go. However, I soon found a program (Spanning Sync) that would synchronize my iCal with Google Calendar. Not long after that, Google began to be a big part of my organized life. Of course, I don't just exist in a Mac world. In fact, most of the computers in my life run Windows and my calendar is also on Microsoft Outlook. What this meant was a conscious effort to make every appointment in 2 places. It's a bit of a pain and requires a constant effort to not forget to put something on one calendar or the other. Imagine my delight to find that Google now offers their own synchronization software for MS Outlook. You can find the download here. I'll be installing it today and hopefully now I can enter one appointment and have it follow me everywhere. This has been rumored for well over a year, but is now finally a reality. United Press International is reporting that Sir Paul has cut a deal with iTunes so that the service can make the Beatles back catalog available for download. The rumored amount of the deal is $400 million dollars. Wow! No word on when the songs will be available, but I'm sure there will be plenty of marketing fanfare accompanying it. Well, that didn't take too long. Although the unit really isn't designed to be taken apart, a good set of tools and a little patience is all that is required. What you can see in the photo is the drive enclosure, the top/back panel (all in one) with the old fan in place, and the outer shell. You can also see the 4 SATA hard drives lined up at the top right. The only snag I hit was when I realized the replacement fan I bought had a different power connector. To remedy that, I just cut and spliced the old connector onto the new fan. So the Drobo is now back online and the new fan is as quiet as a gentle summer breeze. Let me repeat that these types of adventures are not for the faint of heart or the neophyte user. However, if I didn't fix it myself, this would have been a boat anchor. Basically I had nothing to lose. Not to mention I love doing this kind of stuff. Well, not really hacking, but my original beta unit has been having fan troubles. Friday night, the fan just plain died and now the unit won't run for more than a few minutes before it overheats. This afternoon, I'm taking it apart in an attempt to replace the fan. The Drobo is a unit that holds 4 drives and spreads the data over all of them. If one drive is lost, you simply plug in a new one and the system spreads the data over the new drive as well. The beta unit I've had has been working well until as of late and I've found I really depend on it. So I'm going to open it up in an attempt to replace the fan. Hopefully this will mean I'll have it back online later today. If not, then it's time to buy a new one. They've made significant improvements in the units that are now being sold, so my experience with this beta unit is not a concern for regular customers. I also don't advocate cracking open the case if you're device is under warranty as that can void the warranty and then you have even more problems. I'm happy to report a great experience with the Zonet USB 2.0 Leather 2.5" SATA Enclosure. This evening I went to the local Micro Center (my home away from home) and purchased a 320GB Western Digital HDD for $199. Once assembled, I plugged it into my MacBook Pro with the included USB cable. The Mac immediately recognized a new unformatted HDD and offered to format it for me. Within minutes the drive was formatted and is working fine (currently backing up my music). The drive is small, light, and thanks to the leather should be able to be carried around without looking worse for wear. This is a great little device. 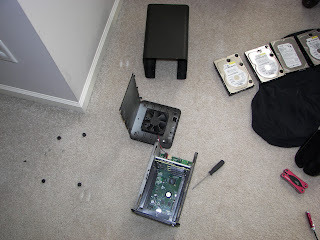 Of course if the hard drive ever dies, I can just remove it and put in a new one. The NewTom CBCT unit has been around for a while now. The one drawback was that it was a large footprint device that required the patient to actually lay down; very similar to a medical MRI. With the increasing popularity of "chair-type" units it seems that AFP has decided to compete in that market as well. The press release is below. If you are in the market for a CBCT unit, this should be on your radar. Elmsford, NY - AFP Imaging Corporation (AFPC.OB) recently announced that it has begun the delivery and installation of the new model “VG” (vertical generation) Cone Beam CT x-ray scanners (“CBCT”) to dentists in the United States, Canada and Europe. The Company recently received regulatory clearance from the FDA, Health Canada and the CE agencies for this new model. It joins the Company’s well respected “New Tom” 3-D imaging product line. The Model “VG” allows the patient to stand, sit or stay in a wheel chair while they are scanned in an upright, vertical position. It utilizes a conical beam of x-rays that passes around the head, allowing the capture of a three dimensional, digital radiographic image of the patient’s teeth and jaw structures. The Company’s technology features proprietary software to capture and quickly display these detailed images. 3-D applications are vital for orthodontics, implants and oral surgery, among others, where complex cases require sophisticated imaging to plan the treatment procedure. Cone Beam imaging is quickly becoming the high tech, gold standard of care for the dental professional. Patients also benefit from reduced radiation dosage and quicker treatment scheduling. I wanted to put this post up directly as I received it from the folks at ePocrates. This is really great news for iPhone users. We wanted to let you and your blog readers know it was recently announced that Epocrates, Inc. was one of only five companies, including Salesforce.com, AOL, EA and Sega, to be highlighted by Steve Jobs during the iPhone Software Roadmap media briefing. Epocrates has already begun working directly with Apple to create a downloadable version of its clinical products that can be downloaded directly to the iPhone or iPod Touch. This will enable healthcare professionals to always have immediate access to vital clinical information wherever and whenever they need it, regardless of Internet connectivity. This announcement demonstrates the influence healthcare professionals have on today’s technology marketplace. High customer demands, as well as the benefit of the product in helping to improve quality of care, were behind Apple’s decision to support Epocrates’ development effort. In the meantime, you can currently access Epocrates free online drug reference at m.epocrates.com with an Internet or WiFi connection. **If you have already installed Apple’s iPhone or iTouch January update, you can now add an Epocrates Online shortcut to your home screen. To do this visit m.epocrates.com, click on the + sign at the bottom of the page. In the menu that appears, touch “Add to home screen”. Enter a name for the icon, then touch “Add” in the upper right corner. I just received my Zonet SATA enclosure. I can't wait to try it out. The SyncMaster has long been a favorite LCD of the crowd that needs a screen to do a little bit of everything. These monitors can do double duty as TV's (since they have A/V inputs) as well as computer monitors. This new batch also has DVI and Samsung's Magicolor technology. This latest generation are very slim and have an amazing contrast ration of 8000:1 (whew!). SAN DIEGO, March 4, 2008 – Iomega Corporation (NYSE: IOM), a global leader in data storage and protection, today announced the new Iomega® REV® 120GB Backup Drive, the third generation of its award-winning REV technology and a benchmark in smart, sensible backup for small and medium-sized businesses, remote work groups and others. Iomega will unveil the new Iomega REV 120GB Backup Drive and REV 120GB disks at CeBIT 2008, the international technology tradeshow beginning today in Hanover, Germany, and running through March 9. Iomega is located at CeBIT in Hall 2, booth D56. The Iomega REV 120GB Backup Drive is expected to be available worldwide in April as external USB 2.0 and internal SATA interface models; a REV 120GB ATAPI interface model is planned for mid-year. Iomega introduced its REV technology with the first generation REV 35GB Backup Drive in 2004, followed by the second generation REV 70GB Backup Drive in 2006. Iomega’s REV products have earned widespread awards from the technology media, strong support from storage software vendors and, most importantly, a worldwide reputation for simple, reliable operation. Designed to provide the performance of a hard drive with the removability of tape, Iomega’s patented REV technology reinvents the hard drive by dividing its components into a drive bay and a low-cost removable disk. The sensitive drive heads and electronics reside in the REV drive; a hard disk platter and fluid-dynamic bearing motor are located in the REV disk. The REV disk is designed for zero maintenance, sealed against outside air contamination while in operation and when not in the drive. The virtual clean room environment of the REV system is supported by automatic head-cleaning, air filtration, and two-stage error correction for automatic data verification. The unique design and economics of the REV platform have caused Iomega’s REV technology to be embraced by many different vertical markets as an ideal tape-replacement solution because of its durability, rewriteability, reliability, and excellent price-performance. In any field with regulatory requirements to archive records, large working files to transfer, or business continuity needs, Iomega’s REV 120GB technology is an ideal fit. Iomega’s new REV 120GB Backup Drive features transfer rates of up to 35MB/second (max), extensive third-party software support, and an estimated 30-year archival life, while REV 120GB disks have an estimated one million rewrite durability – the kind of performance tape backup products can never match. And while tape products require frequent head cleaning, tape retensioning, and an expensive tape replacement regime, REV drives and disks are designed for continuous reliable use with zero maintenance. Reliable data backups are a necessity in most businesses today. Yet the most common storage alternatives have limitations as backup devices. Compared to LTO-1 or DAT160, Iomega’s REV 120GB drive is up to 5 times faster and offers at least 20 percent more native capacity, and the drive costs upwards of 50 percent less. These advantages translate into the lowest total cost of ownership (TCO) for cost-conscious SMBs. Savings include reduced labor, hardware costs, and system downtime. Higher capacity REV 120GB disks also reduce time spent changing media and provide greater consolidation of data. Removable HDDs, such as Go Vault and RDX, which claim a low cost of ownership, actually require users to purchase a complete hard drive every time data storage needs increase. With Iomega’s REV technology, additional REV disks are more economical because each disk contains only the hard disk platter and the motor. Where is REV Technology Used Today? Iomega’s REV products are in use today by small businesses in a variety of different industries. Graphic design firms are using REV disks as project disks to save and share their large files. Academic institutions are using REV disks to store and protect students’ multi-media files. Network professionals are using REV technology as a cost-effective, random access tape-replacement solution. Through Iomega’s Thomson Grass Valley alliance, REV drives are being used for professional video applications. As HD content among consumers becomes widespread, Iomega expects its REV technology to find applications with prosumers in the home as well. Home-based businesses utilize REV for their small business files and to back up their multimedia files. Dental and medical offices are turning to REV to store and archive patient records, including digital x-rays. STI Computer Services, a Pennsylvania-based VAR that specializes in the development, sale, installation and support of medical computer systems, has installed more than a thousand REV drives for clients, which range from single practician offices to physician offices with upwards of 100 employees. Dan Woods, network administrator for STI Computer Services, said the company has been moving its clients to the REV platform exclusively since the REV 35GB Backup Drive debuted four years ago. Over the last four years, Iomega’s REV technology has been utilized in a variety of vertical markets in the U.S. and Europe. With the debut of the REV 120GB Backup Drive, VARs, resellers and other channel distributors are not only focused on existing customers and markets but are also integrating REV technology into new applications and new markets around the world. AMAX Engineering Corporation, a Fremont, California-based value add contract manufacturer with customers worldwide, has been selling REV products to corporations, government and educational entities and OEM customers since the launch of the REV 35GB Backup Drive. James Huang, Product Marketing Manager at AMAX, notes OEM customers utilizing REV drives in such diverse installations as network and storage appliances, servers, semi-conductor, medical, printing, banking, and entertainment products. The Iomega REV product family includes REV 35GB drives and disks, second generation REV 70GB drives and disks, and the soon-to-be-shipping REV 120GB Backup Drive and REV 120GB disks. Iomega also has a REV automation product, the REV Loader 560, which incorporates one REV 70GB drive and up to eight REV 70GB disks in a convenient automated desktop form factor for 560GB of native storage capacity. The new Iomega REV 120GB Backup Drive will be backwards read compatible with REV 70GB disks, meaning a REV 120GB Backup Drive will be able to read a REV 70GB disk, allowing REV 70GB drive users a straightforward migration path to the new REV 120GB drive and disk platform. Iomega provides its users with complete storage solutions out of the box. Iomega REV 120GB Backup Drives come complete with EMC® award-winning Retrospect® Express software for automatic backup and disaster recovery. REV 120GB server solutions ship with CA’s BrightStor® ArcServe® Backup software with disaster recovery. All Iomega REV products, including future availability of the new REV 120GB Backup Drive, are available from a large base of value-added resellers (VARs), systems integrators (SIs) and others that work directly with small businesses on their storage and data protection needs. The new Iomega® REV® 120GB Backup Drive with one removable REV 120GB disk is expected to be available worldwide in April. Iomega REV 120GB disks are also expected to be available in April in single packs and five-packs. Pricing for the Iomega REV 120GB Backup Drive and Iomega REV 120GB disks will be announced closer to product availability. Orthoease™, one of the leading practice management software providers for orthodontists, announced it will exhibit its innovative software this May during the American Association of Orthodontists (AAO) Annual Session in Denver, Colorado. Orthoease™ welcomes all orthodontists and industry press to visit the Orthoease™ booth (No. 316) and speak to company representatives. During the AAO Annual Session, Orthoease™ will showcase its orthodontic practice management software that is revolutionizing the orthodontic industry. In addition, special modules and pre-made scheduling templates are included for doctors using the Damon System. From streamlined Damon torque selection and powerful initial Damon exam process to extraction slips, treatment plans and financial arrangements, Damon doctors can find the necessary tools using the Orthoease™ software. Orthoease™ software is also available via a monthly subscription, allowing orthodontic practices to acquire a practice management or imaging software without any major upfront investment. This pay-as-you-go model, which was launched in January 2008, is an industry first and also allows practices to invest their valuable cash into marketing, practice growth or much needed medical equipment. Orthoease™ is a practice management software system designed by an orthodontist for orthodontists. After completing his graduate studies in Orthodontics at Marquette University in 1993, Dr. Peter Kimball spent seven years on developing a comprehensive orthodontic management system that is unique, easy to use and is based on latest clinical concepts and systems used in orthodontic practices today. Today as a leading practice management software company, Orthoease™ provides the technology and management tools necessary to run a successful orthodontics practice. Long Island City, NY (March 3, 2008) –Sirona Dental Systems, Inc., the company that pioneered digital dentistry more than 20 years ago and the world’s leading producer of dental CAD/CAM systems, is pleased to partner with 3D Systems, a leading provider of 3D modeling, rapid prototyping, and manufacturing solutions, to offer wax patterns to infiniDent users. Offered exclusively through Sirona’s infiniDent service, inCoris WAX patterns will be available by March 2008. These precision wax-patterns, fabricated by 3D Systems’ InVision® DP (Dental Professional) 3D Modeler, are the perfect complement to the infiniDent material line. The new inCoris WAX patterns are indicated for use in fabricating full cast crowns, copings and bridge frameworks, as well as full contour units for press ceramics or over metal and pure zirconium oxide (ZrO2) substructures. Dental technicians who take advantage of inCoris WAX patterns through Sirona’s infiniDent service will save a substantial amount of time and money. Substructure and full contour wax patterns are obtained at one low price through a faster and more consistent method than the conventional labor-intensive and time-consuming technique. New or experienced technicians can effortlessly create restorations by taking advantage of the user-friendly service. Using the inEos scanner, the technician scans the model, designs a virtual wax-pattern using the Sirona 3D design software, and then simply uploads the information to infiniDent for fabrication. inCoris WAX patterns. Laboratories can expect a return in a mere three days. inCoris WAX patterns have a smooth surface finish and can be cast or pressed using conventional techniques. The specially-formulated resin material is virtually ash-free and can be used with traditional laboratory waxes. For more information about new inCoris WAX, please call 866 INLAB4U (465-2248). infiniDent is an Internet-based service concept that caters exclusively to Sirona inLab® and inEos® users. infiniDent enables inLab and inEos owners to derive additional value from their existing technology investments by providing access to a rapidly expanding menu of materials and indications. The infiniDent fabrication service offers an extensive list of material options from material partners including VITA®, Ivoclar Vivadent®, 3D Systems® and Sirona. In addition, infiniDent supports pure zirconium oxide (ZrO2), aluminum oxide (AlO2), non-precious metal (CoCr) frameworks and wax-patterns to support customers in their fabrication of high-strength restorations, including large-span bridges, and predictable shade matching. Chesapeake, VA – March 3, 2008 – Accutech Orthodontic Lab, Inc announced it will exhibit its innovative product line this May during the American Association of Orthodontists (AAO) Annual Session in Denver, Colorado. Accutech welcomes all orthodontists and industry press to visit Accutech at Booth No. 1358 and speak to company representatives. During the AAO Annual Session, Accutech will showcase its orthodontic product line that is revolutionizing the industry, including the Freedom-Lock™ Appliance System. Dr. David Sanders of Morgantown, West Virginia will be at the Accutech booth Saturday through Monday from 11:30 am to 1 pm giving a live demonstration on how to use the Freedom-Lock™ Appliance System. This system can be integrated into multiple types of appliances. Its design delivers a rigid and secure appliance for the patient, but provides the clinical advantage of a quick and easy removal or reinsertion at any time during treatment. Any type of screw that would be used for a fixed RPE can be used with the Freedom-Lock™ system. Its hinged mechanism fills the buccal tube with a snug fit but easily slides in and out, and it has a gentle curve that crosses the occlusal surface. The custom designed “flat” locking clasp is paramount to the retention of this appliance system. Its design delivers a snap-tight lock for insertion and easy release flexibility for quick and clean removal. Freedom-Lock™ RPE delivers superior expansion – it pushes from the lingual and pulls from the buccal simultaneously. In addition to the Freedom-Lock™ system, Accutech will display an appliance from Airway Management, Inc that doctors can prescribe for patients who suffer from sleep apnea—the TAP® 3 Appliance. The Thornton Adjustable Positioner® 3 (TAP® 3) is a mandibular advancement device that improves breathing and eliminates snoring in 95% of all patients. The TAP® 3 helps prevent conditions that are linked to sleep apnea such as chronic sleepiness, high blood pressure, heart attack, stroke, heartburn, morning headache and depression. It treats this condition and reduces the impact of associated health risks without the need for surgery, CPAP or medication. The TAP® 3 provides doctors numerous options to create the best, customized treatment solution for their patients. Accutech is proud to promote its Client Benefits package. By using Accutech’s “One Look Schedule Card,” all of Accutech’s products are guaranteed to be delivered on-time, every time or they’re free. After all orders are completed (within three days) Accutech pays for all shipping charges both ways with second-day air shipping. Clients who use either their Visa or MasterCard can take advantage of Accutech’s weekly program where the lab will take 1.5% off per invoice. Accutech’s state-of-the-art computer system prints the doctor’s preference on every work order. This way Accutech guarantees accuracy and quality workmanship. And if remakes are required, all remakes are free, no questions asked. Accutech does not charge for rush jobs and we are conveniently available 24 hours a day, 7 days a week by emailing a manager. For a of list managers, please call 800-734-7855. Accutech has 10 certified dental technicians (CDT) and encourages all its technicians to participate in continuing education programs. This way Accutech distinguishes itself from other laboratories and advances its level of professionalism. Because Accutech is a certified dental laboratory (CDL), this designation provides assurances to clients and their patients that a certified laboratory has met quality, expertise and safety standards. By earning and maintaining the CDL designation, Accutech illustrates to its clients that it is always monitoring and attempting to improve the quality and efficiency of its services and facilities. Accutech is recognized as a certified dental laboratory by the National Board of Certification, the independent board founded by the National Association of Dental Laboratories certifying dental laboratories and technicians. Accutech provides customers with custom hand-made orthodontic appliances that will not require chair-side adjustment and deliver these appliances to their office on time, every time. Their on-site training facility is staffed with highly skilled team members who are committed to researching new appliance technology and including the best in their product line. For more information about Accutech, please visit www.accutechortho.com. Most of you know I'm a fan of Tablet PC's both for ease of use and the mobility they allow. 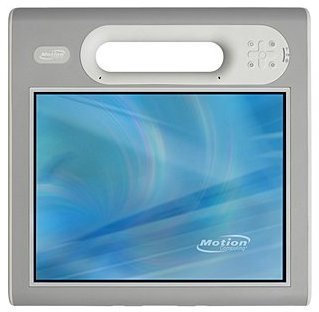 This is a new model from Motion Computing. It comes with integrated Sprint WWAN broadband, an optional 32 GB SSD (so there are no moving parts in the hard drive), and an optional vehicle dock. 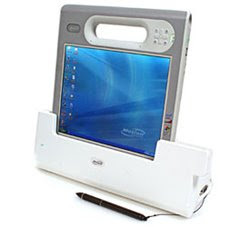 It includes other features such as an integrated 2 megapixel camera, handle, RFID, optional barcode scanner, a 10.4" active digitizer screen, 1024 x 768 resolution, and a 1.2 ghz Core Solo processor. The F5 weighs 3 lbs 9 oz. The handle is an especially nice option for health care settings. The Belkin company makes really great products and some of them are *really* better ideas. This, in my opinion, is one of them. 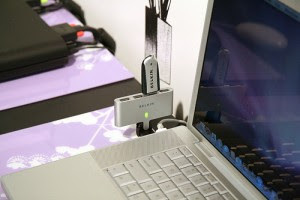 It is a USB hub designed for travel, but I can see it being useful for some doctors in the treatment area as well. It has the ability to rotate and swivel 180 degrees so that it can be used on a laptop with limited USB ports. However, there are plenty of other places you can use such a forward thinking product. It turns one USB port into four. Combine its design with a $30 price tag can you can easily see why I'm impressed.